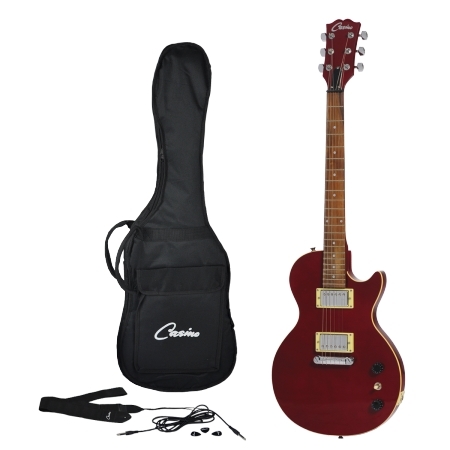 The Casino CLP-1-WRD LP-Style Electric Guitar Set is an ideal set for the beginner or intermediate guitarist. The popular LP-style electric guitar was one of the first solid body electric guitars designed by America’s oldest iconic guitar manufacturer and named after the guitar legend Les Paul. This LP-Style guitar features a solid Alder body, hard Maple bolt-on neck, Rosewood fingerboard with dot inlays, and twin Humbucker pickups. It also has two volume and two tone controls with three-way toggle switch, as well as chrome diecast machine heads and hardware. Comes complete with gig bag, guitar strap, lead and pick. Finished in Wine Red gloss.